The seven boats in the Royal Akarana Yacht Club’s Auckland to Gisborne Race started in lack lustre conditions, but as the race continues, the fleet is getting all sorts thrown at them. V5 crew member Ben Gladwell contacted RAYC Race Management this morning. “We were cruising along at 20-22 knots but in the last 30 minutes have dropped down to 7 knots,” said Gladwell. Anarchy posted to their Facebook page saying that it was raining, with crew member Bex Hielkema “in the dog house” to stay dry. The boats are currently out of cell phone coverage area which means the PredictWind trackers are not reporting, however when the fleet comes back into range, their tracks will update. Race Officer Fred Price was all smiles on the start boat when the gun was fired, bringing back a lot of memories for this yachtie, who has 50,000 odd miles of offshore racing and cruising under his belt. “I did this race in 1983. Love it then, and loved it now. In 1983 it was a very quick race. We were on a new Mull 40 Southback and had a very fast trip across the Bay of Plenty but blew out two spinnaker halyards. I can’t really recall too much more from the race, and I can’t remember too much from Gisborne either! Needless to say, I’m sure we had a great time,” said Price. 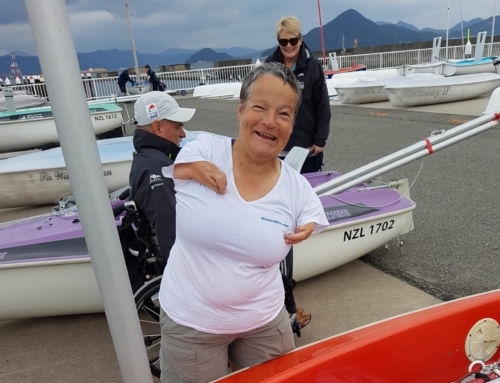 “Being on the start line yesterday it brought back lots of fond memories of Royal Akarana Yacht Club offshore racing, and reminded me of my youth. I’m sure this fleet will be having just as much fun as I did. It’s great to see the legacy continue,” continued Price. Peter Millar, Vice Commodore at Gisborne Yacht Club was totally enthusiastic when the idea of running the race again was suggested. “I’ve had no sleep! 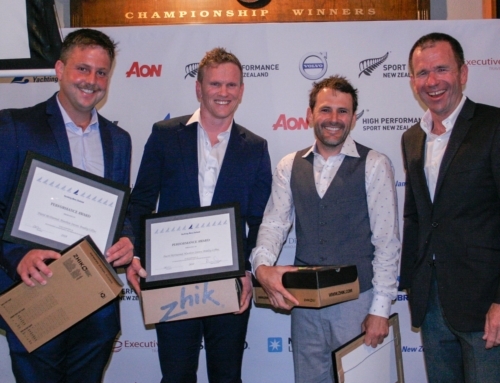 We wanted to make sure we put on a great show for our Auckland friends, and my team and I have been working around the clock to be ready,” said Millar. “I’ve personally done the Auckland to Gisborne Race myself, three times actually. We were sailing on a senior reacher and we were on the wind the whole way to East Cape. There were just four of us on board including my mate Colin Shanks, the owner and his mate. The two latter were violently sea sick until we were around East Cape! On rounding East Island in the pitch black and we asked the skipper if we could put the kite up. He said he didn’t care, but it did result in the masthead kite going up, not the fractional, and then immediately we started wiping out! But it was awesome! “We can’t wait to get out there and meet the boats racing in this years event. Gisborne Yacht Club is providing the welcome packs for all the boats which includes some delicious oranges from Kaiponi and refreshments from Sunshine Brewery,” continued Millar. The first boat the finish, expected to be V5, should cross the finishing line in front of Gisborne Yacht Club some time after 1100 hours today.